That was Johnson’s line in December 2003. His Atlanta-hating downstate constituents loved it. The Big City was flat on its back. Gov. Sonny Perdue wasn’t much better. He said the state didn’t have any money to give Atlanta to fix its sewers, or to do anything else. Atlanta made its own mess; let Atlanta clean it up. Such was the view of Georgia’s first GOP governor in modern times. The Atlanta capital, once hailed as “the world’s next great city,” was on the brink of going bust, of becoming the world’s next great urban calamity. The federal court breathed down the city’s neck with an order to stop fouling the Chattahoochee with untreated waste. The word “receivership” was in the air. No one — not the state government or even the feds — wanted to help. Dirty water wasn’t the city’s only problem; the pollution issue simply symbolized everything else that had gone wrong and appeared to be unfixable. Violent crime, unmanageable traffic, dire poverty, substandard housing, second-rate schools — you name the urban problem, Atlanta served as the worst example. No matter where you turned, Atlanta faced a crisis. Buckhead, once a center of affluence and decorum, was becoming a hotbed of nightclub mayhem and dope trafficking. Northside homicides, unheard of just a few years ago, had turned into a staple of the nightly news. On top of that, suburban legislators drew up a bill to allow the state to take over Atlanta’s proudest possession: Hartsfield-Jackson International Airport. “Super Shirley” had saved the day. Mayor Shirley Franklin had snatched, for the beleaguered city, salvation from the jaws of impending disaster. The details of how this diminutive woman with the great flower on her blouse has seemingly put Atlanta back on the road to greatness may never be known. How arms were twisted, ordinances were changed, deadlines were postponed and shady guys were persuaded to move elsewhere — those parts of Atlanta’s convalescence are too obscure and convoluted to be explored here. Whether Atlanta makes a complete recovery is still up in the air. But the first black woman chief executive of any major American city has turned out to be the miracle mayor for Atlanta. In her first two years, the tireless Franklin has tackled a thousand problems and made remarkable progress on solving most of them. Besides being female, what’s so different about this 58-year-old former career bureaucrat who is running Atlanta City Hall? Why is the formerly melancholy business leadership of the city suddenly smiling and embracing Franklin as they have no Atlanta mayor since the late Ivan Allen Jr. in the 1960s? For starters, businesspeople like her because, no matter what she does, she seems terrific compared to her immediate predecessor, bad-tempered Bill Campbell, who served eight years as mayor (1994 to 2002). Before Campbell, Atlanta (or certainly the business community) had enjoyed more than 60 years of prudent stewardship at city hall. The business community, isolated from city-government decision-making for the first time, quickly came to regard Campbell as the devil incarnate, blaming him, rightly or wrongly, for a myriad of sins ranging from the not-quite-successful Atlanta Olympics to an aura of corruption and indifference surrounding City Hall. Though “Just call me Shirley” Franklin emerged from the same political background as Campbell, she brought a refreshing new style to the office. She reached out to the white business community, being careful at the same time to protect her black power base. Judged against Campbell, Franklin is a class act, at least in the eyes of the city’s commercial leaders. Yet if Campbell is making her look good by comparison, he also dictated, albeit inadvertently, Franklin’s agenda for her first two years in office. On the day of her inaugural, she was greeted by a nonfunctioning city bureaucracy and a deepening financial mess. She went to work immediately streamlining city government and hunting for new places to find cash. She created along the way a sizeable collection of new enemies (particularly among municipal union activists). A reporter asked her to compare her first-year performance to that of Gov. Roy Barnes’ inaugural year, when he set out in 1999 to completely reform state education, change the state flag, eliminate traffic congestion and reduce air pollution. His energetic start generated so much enmity among voters that he was defeated for re-election. Until she became mayor, Franklin had never served in elective office. She worked as a behind-the-scenes bureaucrat, starting in the office of Mayor Andrew Young in the 1970s. George Berry, a former Atlanta chief administrative officer and later airport commissioner, notes that the record of bureaucrats moving into elective office is not always good. Franklin may be an exception, he says. And former Mayor Sam Massell, now president of the Buckhead Coalition (an organization devoted to protecting business interests in northwest Atlanta), praises Franklin for turning attention to neglected Buckhead and beginning to help sort out the Northside’s many problems, including a lack of adequate police protection. * The city’s demographics are changing rapidly. Atlanta now has more condos and apartments than single-family detached housing (50.7 percent multifamily dwellings compared to 48.8 percent single-family housing.) Experts say those numbers may mean Atlanta is becoming a city of the very rich and very poor with a shrinking middle class in between. * Despite MARTA, the city still needs mass transportation. The proposed Atlanta BeltLine, pushed by both Mayor Franklin and Council President Woolard, would create a transportation corridor along underutilized and abandoned railroads to serve Atlanta’s in-town neighborhoods. The BeltLine would connect more than 40 historic Atlanta neighborhoods and cross more than 4,000 acres of industrial land suited for green space and mixed-use development. However, railroad companies, the owners of the right-of-way, are less than eager to see the development started. A study of the idea has been turned over to MARTA, an agency not noted for acting swiftly, decisively or even successfully. * The revitalization of Underground Atlanta shows promise. Several Buckhead bars have agreed to move out of the Northside and into Underground so they can remain open later than other city nightspots. (Underground has a special variance in city law allowing for after-hours bars.) But several nightclub owners have expressed anger at being “pushed out of Buckhead.” And Mayor Franklin says she has no interest in making Underground Atlanta into a “red-light district” for adult-oriented enterprises not welcome in other parts of the city. * A clash of culture between city and state governments may be in the works. A city panel has found that Druid Hills Country Club discriminates against some Atlanta residents by refusing to extend club benefits to partners of its gay members. An attorney for the club has said the city’s antidiscrimination ordinance is “totally invalid” because it is at odds with state law. The gay-marriage issue has become a major political issue nationally and in the state. Atlanta could find itself squarely in the middle of the squabble. The city’s newfound allies in the Gold Dome may find pro-gay Atlanta an unbearable burden in an election year. 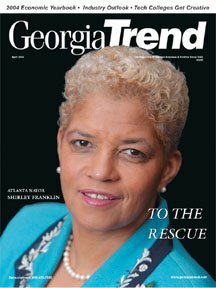 Even so, Mayor Franklin, beset by immediate crises and intermediate headaches, may take satisfaction in knowing that the trend favors Atlanta, the sewer issue notwithstanding. For instance, the city’s traffic problems are minute compared to the gridlock plaguing the suburbs. Other than the wastewater problem, Atlanta has an infrastructure that will support a much larger population than now exists within the city limits. The trend toward smaller households will further strengthen the downtown housing revival in the coming years. Retail stores and service industries will return as the population increases. Sports, entertainment, the arts and higher education are already well represented in the central city and will become increasingly important in the coming years.